I have a confession, grilling chicken scares me. I constantly worry about turning what could have been a lovely dinner into the nasty, hard, dry chicken we all know and hate. In the past, I’ve over-turned it (no grill marks), under-cooked it (who’s up for a round of Salmonella?) and just given up. I was on the path of snubbing grilled chicken completely until our little grill entered the scene. Now, the possibilities are endless! After about 3 hours at Home Depot comparing tiny grills, we finally decided on the Brinkmann portable grill. We were extremely skeptical at first; the grill is small, only provides 7,000 BTUs (for comparison, your average propane grill burns at 32,000 BTU) and has legs that closely resemble the walking carriage out of Beauty and the Beast. The grill is really more of a smoker and flames up ridiculously whenever you put any sort of grease or oil on the hot plate that is located about 1/2″ from the grill grate (not the best design), BUT we have had amazing results. So far, we’ve had sweet and succulent grilled pineapple, perfectly charbroiled hamburgers filled with bacon, jalapenos and cheddar, juicy pork chops and, most recently, perfectly grilled chicken legs. My fears have been quelled. These marinated drumsticks turned out wonderfully with a great crust and juicy, smokey meat inside. 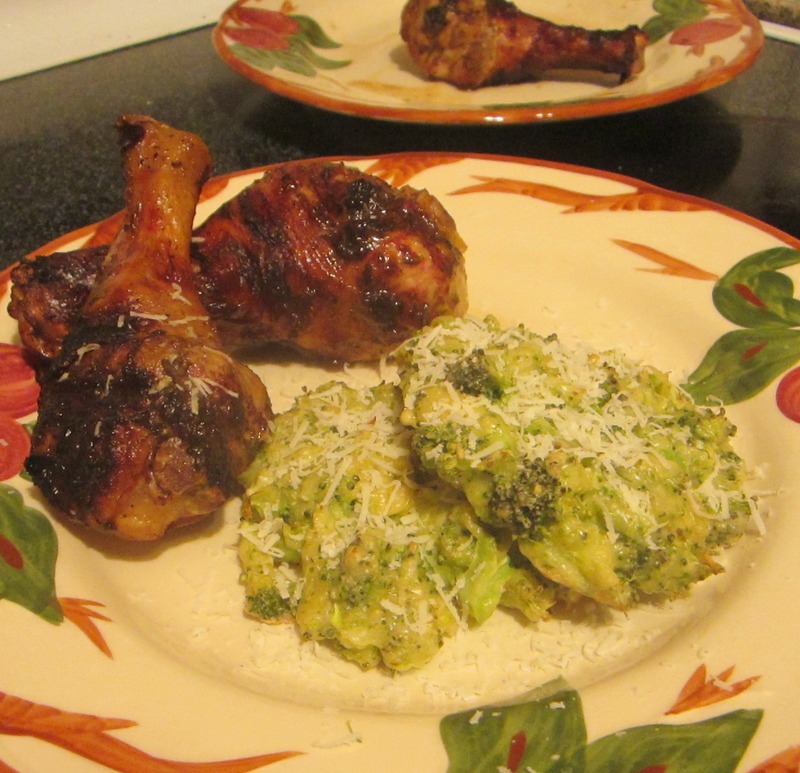 Served with a couple of broccoli cakes, these drumsticks made for a tasty, and triumphant, summer dinner. 1. Prepare the marinade. In a large mixing bowl, combine all ingredients from the olive oil to the Worcestershire sauce. Mix thoroughly. Slowly whisk in the beer. 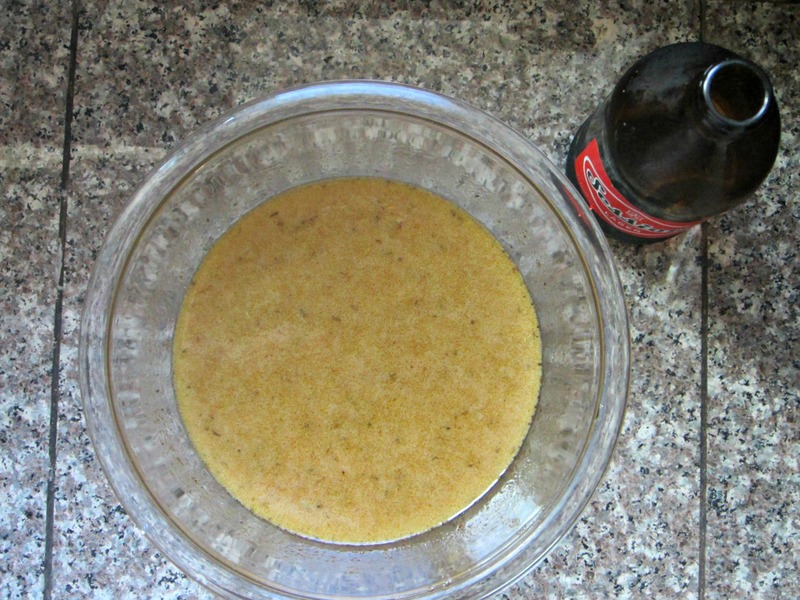 The beer will cause the marinade to bubble up a bit and you don’t want that mess all over your kitchen. I used Session amber in my marinade, but feel free to use whatever amber beer you have on hand. 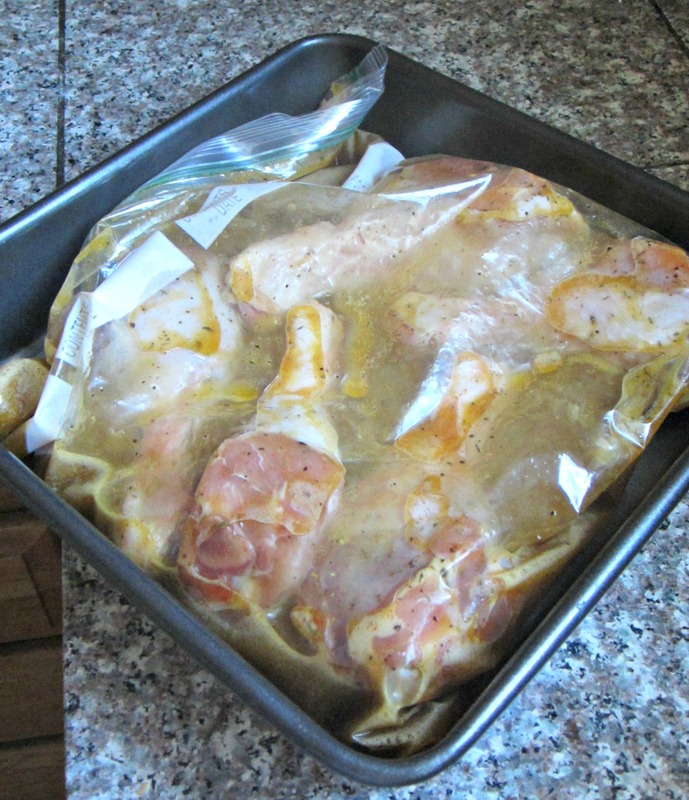 Once the beer is incorporated, reserve 1/2 cup marinate for basting later and pour the rest of the marinade into a plastic bag with a great seal and add your chicken to the bag. Mush the marinade and the chicken together to make sure the marinade covers the chicken completely, place bag in a baking dish to prevent spills and refrigerate for 1-4 hours, turning occasionally. 2. 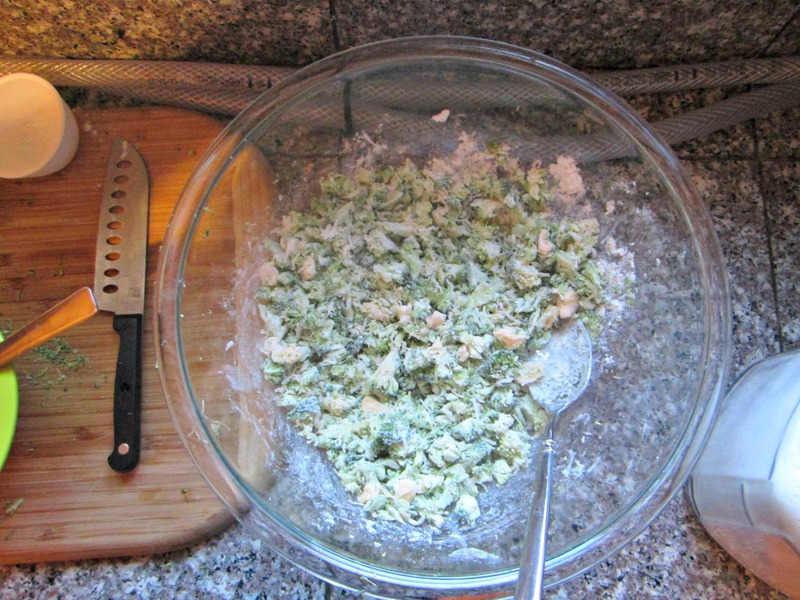 While the chicken in marinating, whip up some broccoli cakes! Preheat your oven to 400 degrees. Dry the broccoli as well as you can (without mashing it) and then combine broccoli with all the other ingredients in a large bowl. Gently mix until all ingredients are incorporated. 3. 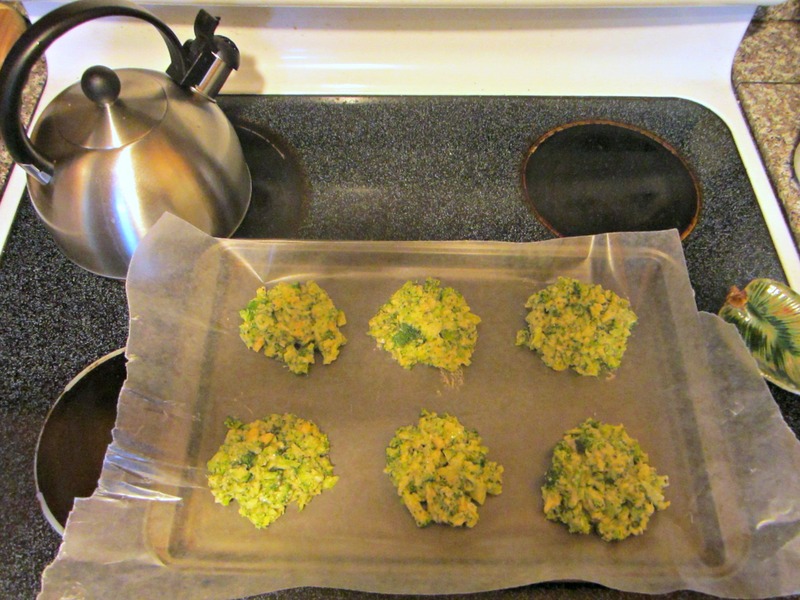 Bake broccoli cakes on a parchment paper lined cookie sheet for 15 minutes or until golden brown. Top with freshly grated Parmesan if you like. 4. Back to the chicken. While the grill is COLD, dabble some olive oil onto a paper towel and rub down your grill grates with the oiled paper towel. No burned fingers here please! Heat your grill to medium-high heat. 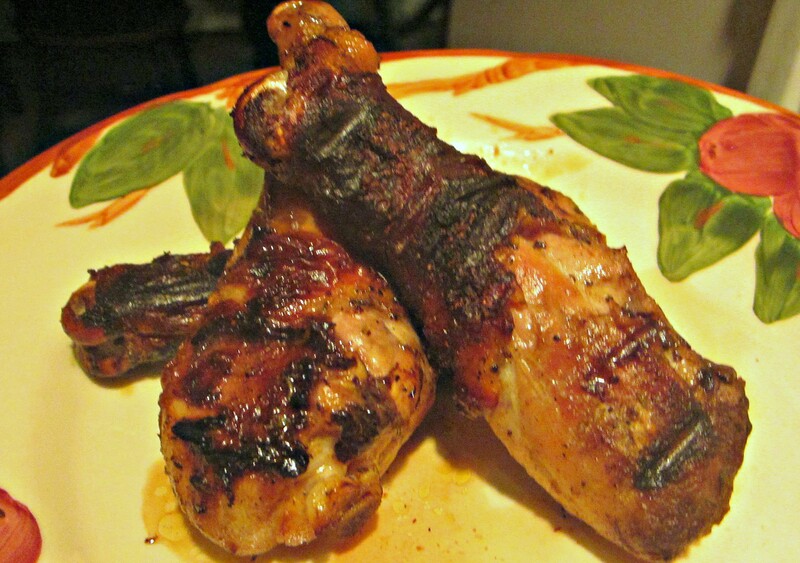 Remove chicken from marinade and place on a platter.Cook your chicken legs for 2 minutes a side. Each time you flip the drummies, baste with your reserved 1/2 cup of marinade. Careful of flare-ups! 5. Once the chicken has reached an internal temperature of 165 degrees, remove from grill and let rest on a clean plate for 5-10 minutes. Serve with your broccoli cakes and enjoy your summer night! This meal was delicious, as were all the others! I do have something to point out though, was it the quality of the grill that made the chicken so delicious, or the skill of the griller?